It’s Halloween season! It’s a big deal to our daughters and our family is looking forward to Brooke’s Fall Fest to showcase our costumes. We love Halloween and look forward to reading new Halloween books of the season. I have a fun one today and it’s all about ‘Monster’ trucks! Ready, set, go! 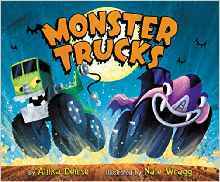 The monster truck race is on in Anika Denise’s frightfully delightful picture book. The book takes place on a spooky speedway, where all the Monster Trucks moan and grumble! There is Frankentruck, Zombie Truck, Ghost Truck, and many more Halloween-esque Monster Trucks that race to the finish line. You anticipate who will win the race as you and your child soak in the Monster Truck’s spooky battle and the race has a frightfully fun twist on an unexpected contender. It’s an awesome book for Halloween and we enjoyed incorporating things we learned while watching the Rio Olympics about competing and finishing in competition and that sometimes it’s someone you least expect to win, but it’s all about opportunity meeting preparation. Even for tricked-out Halloween Monster Trucks! Adorable! About the Author: Anika Denise is a children’s book author and poet. When not writing tales of vroom and doom, she can be found zipping around her hometown of Barrington, Rhode Island in her Monster Minivan or reading not-so-scary stories to her kids. 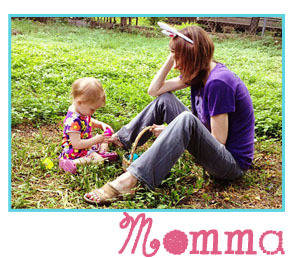 Her most recent picture books include Monster Trucks (Harper 2016), illustrated by Nate Wragg; and Baking Day at Grandma’s (Philomel 2014), illustrated by her husband Christopher Denise. She has several more coming soon, including Starring Carmen (Abrams 2017), the first in a new picture book series illustrated by Lorena Alvarez; and The Best Part of Middle (Christy Ottaviano Books 2018), illustrated by Chris. Anika and Chris live in a little house near the sea, with their three daughters, overgrown vegetable gardens, pesky squirrels and a slew of imaginary friends. Visit Anika online at anikadenise.com and on Twitter @AnikaDenise.